If you are getting fed up of all the vampires, booze mail and super wall posts, then help could be on the way. The social network site Facebook is getting ready for the first major makeover in its short history. Designers are planning some widespread changes to the way the core profile page is organised, aimed at making it “simpler, cleaner and more relevant”. The site is consulting its users on the changes ahead of a gradual roll out starting next month. 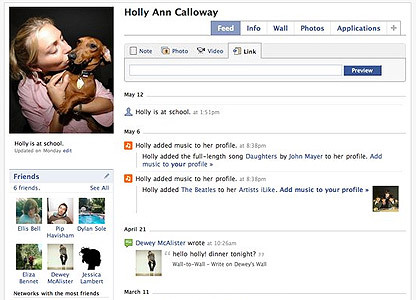 Facebook is currently based around a single main page showing a news feed, friends and applications. But critics say a big increase in the number of free gifts, games and quizzes has left the site looking cluttered and confusing. Facebook’s answer is to split the main profile into five separate pages, all accessed by clicking on tabs at the top of the screen. It is likely that the “wall” function, which lets users post comments and messages about their friends, will be moved off the main page and onto a separate tab. A single “publisher” function will let users add video, photos and links to the wall. Applications like games and quizzes will also be moved on to their own dedicated page. Facebook is now the most popular social network in the UK with 8.9m members, according to the most up-to-date figures from Nielsen Online, the internet research company. When it launched to the general public in 2006, it was seen as a clean and simple alternative to its main rival MySpace, which gives its users much more freedom to design their own pages. You are taking away exactly what made Facebook unique. What are you thinking? 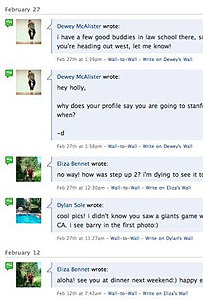 Facebook jumped in popularity when it decided to let commercial, third-party companies develop their own applications for the site. There are now 25,000 different pieces of software available ranging from dating games to music players and time-wasting quizzes. But some users say their pages have become bloated, cluttered and annoying. Tens of thousands have joined Facebook petitions asking for the site to disable the ‘invite’ function on applications. Facebook has been working on its “decluttering” project since the start of the year. In the past, the site has been criticised for introducing new functions without properly consulting its users. It was forced to backtrack last year after it tried to introduce a new advertising system that collected information from other websites about a user’s activities. This time around, it has set up a group to consult on the changes. A total of 85,000 Facebook users around the world can comment on new features as they are proposed. The first reviews are mixed. Some users support the project, others are already disappointed. This entry was posted on Thursday, May 22nd, 2008 at 8:59 am and is filed under Social Networking. You can follow any responses to this entry through the RSS 2.0 feed. You can leave a response, or trackback from your own site.